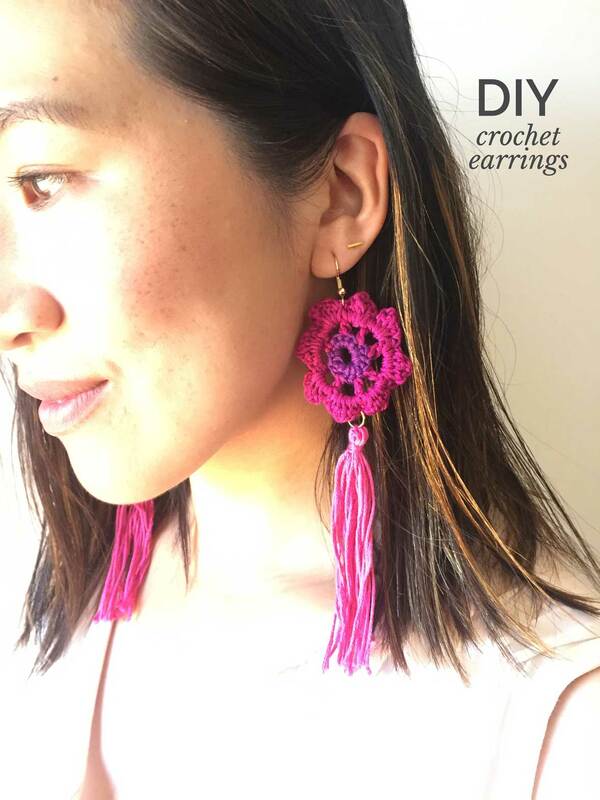 This crochet earrings pattern is just the thing if you’re looking for a fresh take on traditional crochet projects. 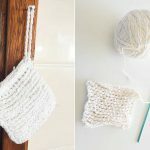 It’s part of an amazing new craft resource I’m proud to be part of, the Handmade with Love Super Bundle. 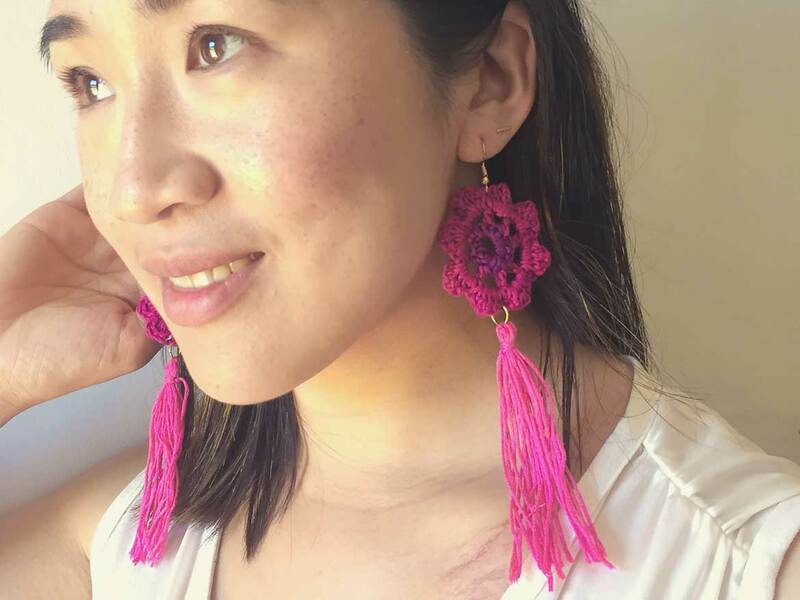 There’s more than 200 patterns, tutorials and courses included in the Handmade with Love Super Bundle, including this crochet earrings pattern by Dobromira Velikova. The bundle is available for $47 USD only until November 30, 2018 (EST). so make sure you grab one by clicking here. 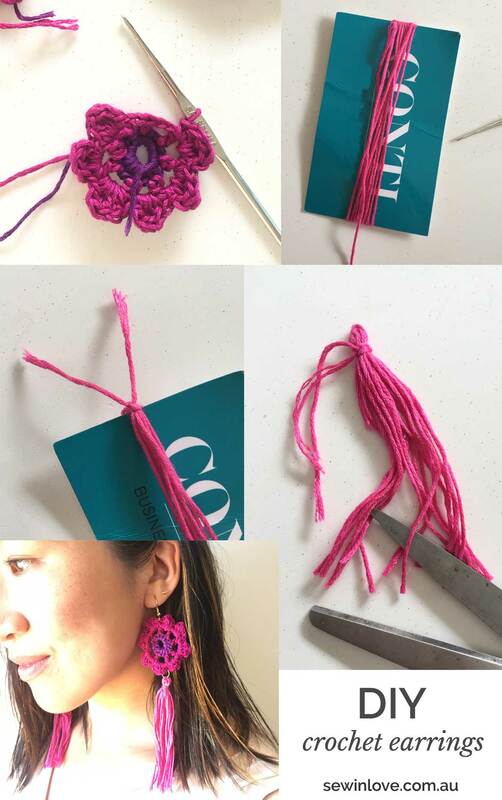 Dobromira has created a set of four crochet earrings patterns and I chose to make the Flower Crochet Earrings. I decided to use three different colours of yarn because it’s such a fun way to add a bright punch to my otherwise monotone outfits. I think keeping the colours tonal ensures the earrings looking sophisticated. Clashing primary colours just reminds me of my daughters’ toys! The bohemian vibe I was aiming for wasn’t complete until I added a long tassel. Who would have thought, a business card would be the perfect size to create an earring tassel? Just wrap the floss about 10 times lengthways and tie a knot at one end. Then, remove the card and tie a 10cm (4”) length of floss near the knot to secure the tassel. Snip the opposite end of the tassel and you’re done! 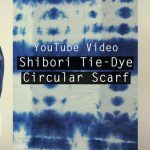 50 craft bloggers including myself and Dobromira have come together to create an amazing bundle of digital craft resources. 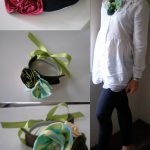 My ebook, How to Sew Japanese Sewing Patterns is in the bundle as well as two sewing patterns (worth $25.00 USD alone). The Handmade with Love Super Bundle includes a whole lot more sewing, embroidery, crochet and other crafty resources and is available for $47 USD. But the deal ends November 30, 2018 so please go over here to check out all the drool worthy craft projects in the bundle asap!